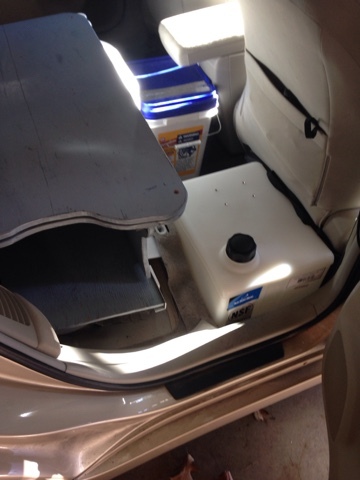 Last year traveling in my Prius I knew every cubic inch was valuable. 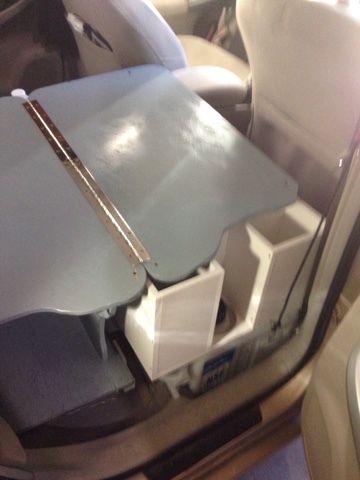 Having downsized from my Class B campervan a lot of work went into finding items that would replace full size items. These changes were not necessarily cheap. For example I had a standard folding camp chair that slide into a cylindrical draw-string bag. I had no room for it but wanted a chair so I bought the REI backpacking folding chair at a tenth the size. 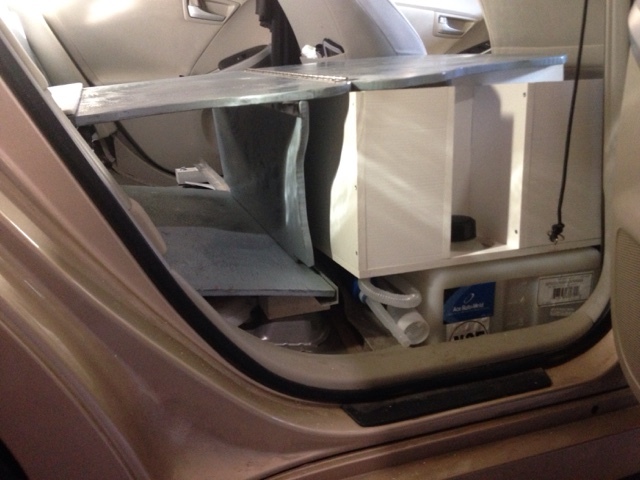 Even with doing all this planning, replacing items, and replacing the Prius foam fold down rear seats with 1/2" plywood it was still tight for space to live in and out of the Prius. 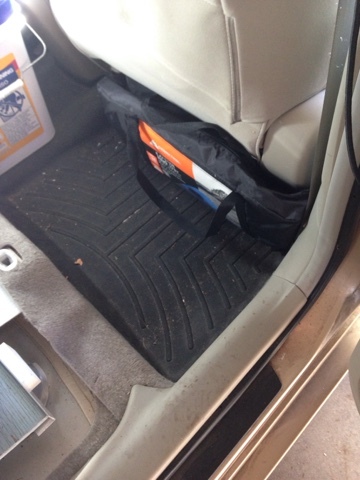 The 60% side is where I sleep and under the rear passenger wheel well is where I stored water and my clothing. 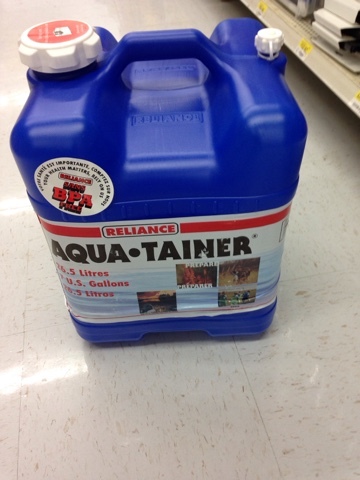 The water tank was the 7 gallon tank from Walmart. This worked ok but it's size was difficult to manage the space around and above it. I put my clothing in waterproof pillowcases to keep them together and clean. The problem was that this method also allowed the pillowcases to slide and catch on things and rip the bags. I also didn't need 7 gallons as I was able to live on a gallon a day on average, and carry 2 one gallon water jugs on the front passenger floor that I fill from my tank so when I want water I don't have to pump the water. The space under my bed is easy to access as it is under the folding plywood platform I made last year. The space and access is key to my redesign of the space for this year. 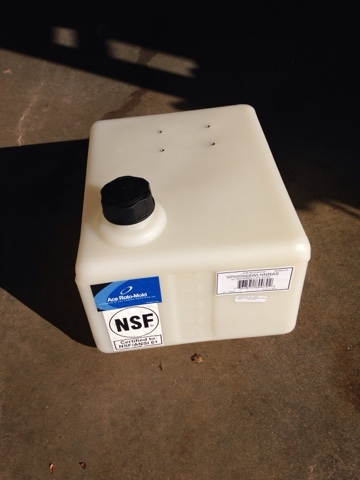 First I needed to come up with a replacement for the 7 gallon water tank. My choice was this 6 gallon freshwater Poly tank with off-set fill. The tank fits perfectly in the wheel well behind the passenger seat and the seat is still positioned if I want to take a passenger. Now I needed to design the space around the water tank. 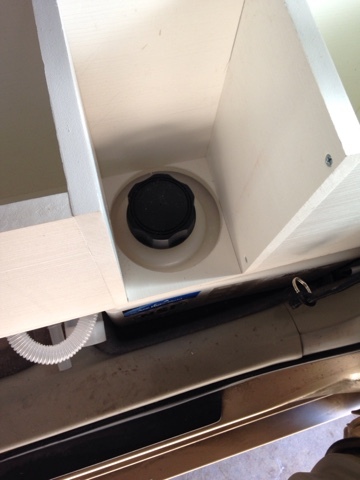 My first step was to Design and build a fixed wall container for my clothing that sits on top of the tank. I decided to make it out of 1/2" PVC plastic leaving a notch for access to the water tank. The plastic wood needs no finishing. 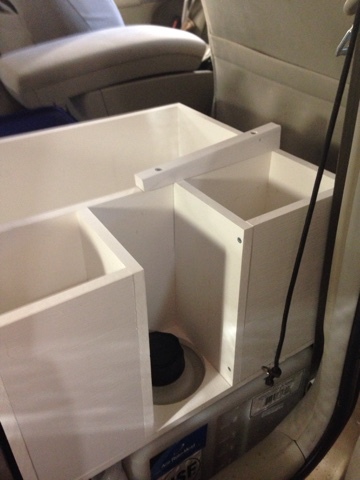 The water tank comes with 4 threaded inserts on top in case you want to use an electric pump. I use a hand pump to extract the water right now so I used 2 of the 10-24 inserts to hold the storage unit to the tank to keep the plastic from sliding. Here is the water access left open to access during my travels. You can see I can easily access the water fill from the side door. And my bed platform mostly covers the storage. The shape of the plywood was necessary for it to fold up when I wantt he space. I needed to add a tapered shim to support the plywood sleeping platform. 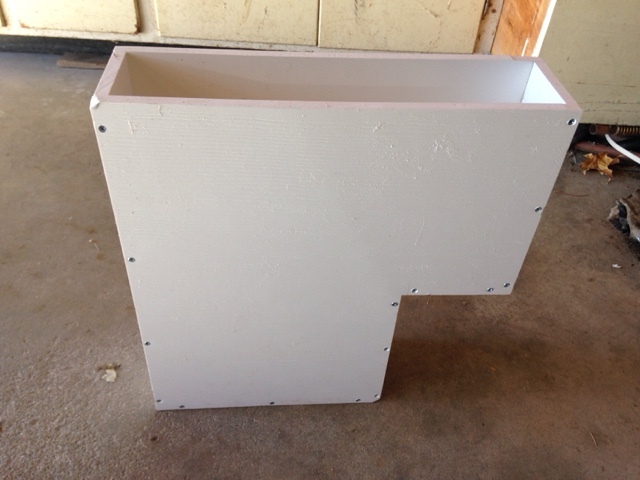 Here is a side view of the plywood platform supported by the shim top of the storage unit on top of the water tank. Just to the left of the tank (above photo) is my hand pump in a void space created in the design. 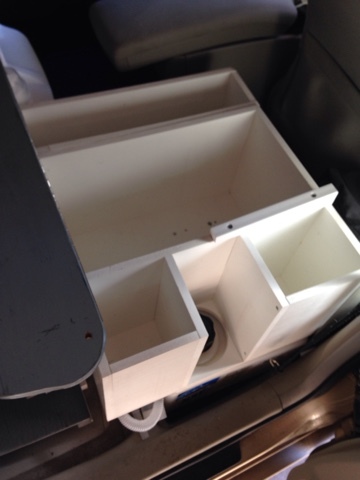 To the center console I still had some space for storage. 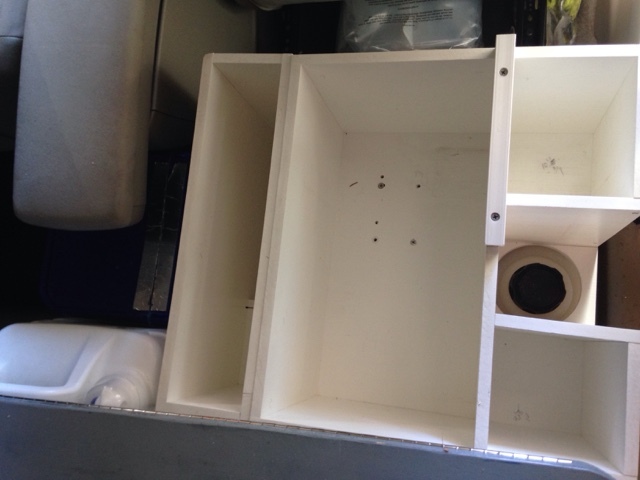 In the photo above you can see a matching insert to fit next to the storage that sits on top of the water tank and uses all the space from the floor up. 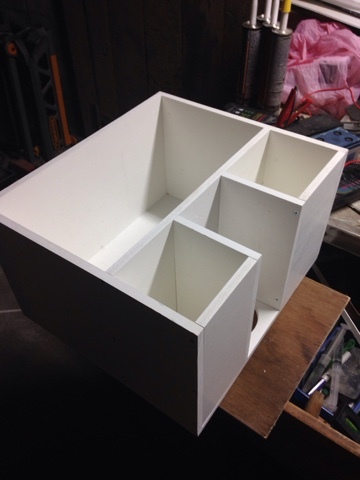 The picture above shows how the matching box I made rests to the side of the first storage box. I could have made one box to fill both spaces and save a 1/2" of plastic wood thickness, but I thought the modular aspect of this space may be useful. Here is my top-down view of the storage. To the left in this picture is a detergent bottle I use for waste water.